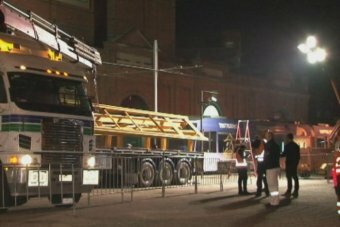 A man has been seriously injured while working on the light rail network in Sydney's CBD overnight. A WorkCover spokeswoman said the man, believed to be in his 40s, was helping to remove two rail carriages from the back of a truck when he became trapped about 1:00am. The man, who was employed by light rail operator Transdev, managed to free himself before paramedics arrived. He was taken to St Vincent's Hospital, where he remains in a serious but stable condition in the intensive care unit. A WorkCover inspector attended the site, on the intersection of George and Hay streets. WorkCover said its investigations are ongoing. Transport New South Wales is upgrading the trams used on the existing inner-west light rail system.